(245 hp) now takes the lead among the four-cylinder models. Yet more power comes with the equally new C 450 AMG 4Matic, whose V6 engine delivers 270 kW (367 hp). At the same time Mercedes-Benz will be introducing new equipment options for the C-class. With immediate effect five new models have been added to the C-class range, which at its launch a year ago set new standards in the premium executive segment. All new models are available in both Saloon and Estate variants. The family genes of the new models give them a sporty interior with a high-quality look and feel and excellent sense of spaciousness, the lightest bodyshell in this segment, fuel-efficient and responsive engines, exemplary efficiency, a comprehensive range of safety features and an agile and comfortable suspension, along with many other innovations. The entry-level model in the C-class is now the C 160 Saloon, with a list price of 31,683.75 euros. This is around 2000 euros less than for the C 180 Saloon, which until now was the least expensive model in the C-class range, at 33,706.75 euros. Customers who buy the corresponding Estate model will enjoy a comparable financial benefit. The four-cylinder engine in the C 160 delivers 95 kW (129 hp) from a displacement of 1,595 cc, along with torque of up to 210 Nm. The C 160 Saloon is capable of accelerating from 0-100 km/h in 9.6 seconds (9.9 seconds for the Estate). The Saloon, with its six-speed manual transmission, makes do with just 5.2 litres of premium fuel over 100 kilometres (5.4 litres for the Estate). This corresponds to CO2 emissions of 120 grams (125 grams for the Estate) per kilometre. 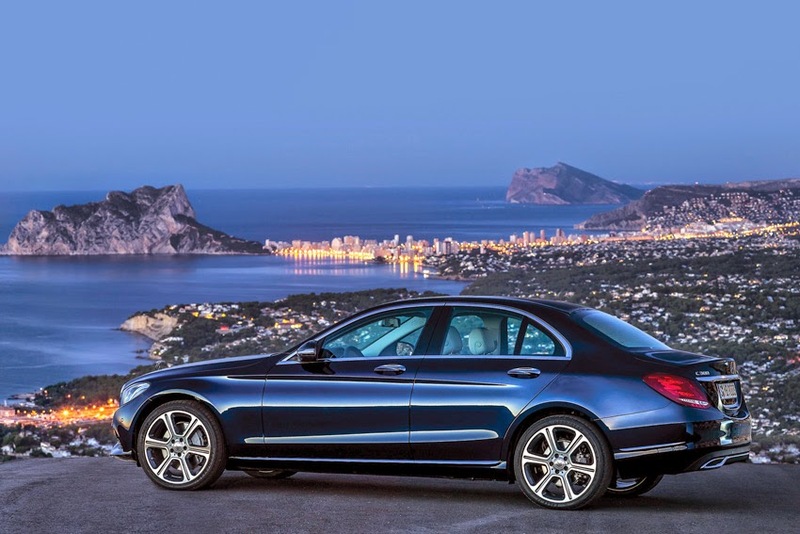 The new C 200 4Matic as well as the C 220 d 4Matic models make the Mercedes-Benz four-wheel drive system available with immediate effect in the premium executive segment, also at a significantly reduced price level. The C 200 4Matic, for example, offers this powertrain system from 41,441.75 euros. The top-of-the-range position among the four-cylinder engines is now taken over by the new C 300. Due to an output of 180 kW (245 hp) from a displacement of 1,991 cc, it develops distinctly sporty characteristics. It can accelerate from a standing start to 100 km/h in 5.9 seconds (6.1 seconds for the Estate). Despite this altogether sportier performance, the C 300 consumes just 6.3 litres of fuel over 100 kilometres according to the NEDC combined figure (6.4 litres for the Estate). Yet more power is available from the V6 petrol engine in the new AMG Sport model, the C 450 AMG 4Matic. From a displacement of 2,996 cc, it delivers an output of 270 kW (367 hp) and a torque of up to 520 NM. The sprint to 100 km/h in this case takes just 4.9 seconds (5.0 seconds for the Estate). Its combined fuel consumption (NEDC) stands at 7.6 litres per 100 kilometres (7.7 litres for the Estate). Also now available from dealers are the two new AMG models, the Mercedes-AMG C 63 and the Mercedes-AMG C 63 S, which have already celebrated their world premiere. These gutsy, high-performance rear-wheel-drive sports cars are powered by a 4.0-litre V8 biturbo engine: this develops an output of 350 kW (476 hp) in the C 63 and 375 kW (510 hp) in the C 63 S, making this top-of-the-range V8 model the most powerful car in its segment.